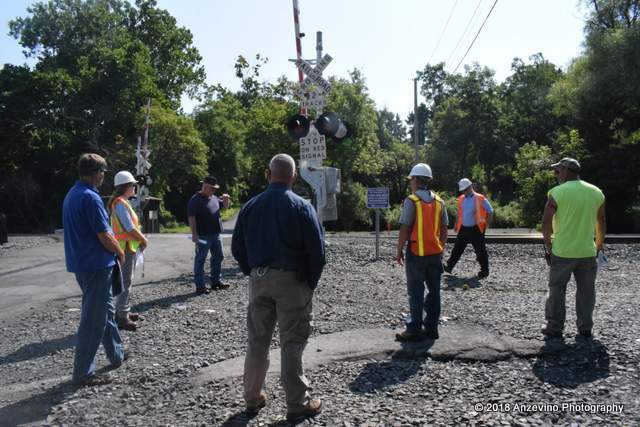 In early March of 2018 Amtrak proposed installing fences and gates at eight locations between Rhinecliff and Stuyvesant designed to block access along miles of the east shore of the Hudson River in Dutchess and Columbia counties (between New York City and Albany). Amtrak supplied a Federal Consistency Assessment Form to the New York State Department of State, which started a Coastal Consistency Review to determine if Amtrak’s proposal was consistent with New York State’s established coastal policies. Local communities were not consulted prior to the application, and the numerous mistakes in the application led many to think there was little thought to the impact. There was a public comment period that closed May 1, 2018. Over 300 comments were submitted to the NYS Department of State. On Tuesday, April 24, 2018 a meeting was held at the Columbia County Office Building at 401 State Street in Hudson. Congressman John Faso organized the meeting between officials from Amtrak, NYSDOT and NYSDOS and the supervisors of Germantown, Stockport, Stuyvesant and Rhinebeck, as well as the mayors of Hudson and Tivoli. In addition to Congressman Faso, Assemblymember Didi Barrett and the chief of staff for Senator Marchione participated in the meeting. During the late spring and early summer of 2018 Amtrak repeatedly extended the DOS Consistency Review deadline. During the summer of 2018 Amtrak met on site with several of the impacted communities. The Germantown on-site meeting was on Friday Aug 24th. At that meeting two Amtrak representatives, and an Amtrak Police representative, had informal discussions with Germantown Supervisor Beaury, Germantown Fire Chief Lawson, Germantown Waterfront Advisory Committee co-chairs Jen Crawford and Kaare Christian, and Scenic Hudson’s Jeff Anzevino. Also present were two representatives of the NYS DOT and a representative from U.S. Congressman Faso’s office. The meeting was strictly informational, so that each participant could better understand the views and concerns of the other participants. On September 6 Germantown Supervisor Beaury and other local leaders sent a second supervisor’s letter to the DOS asking for them “take an interest in how the outcome of this application will have an immediate and negative impact on our communities.” The letter called for additional comment periods, and mitigation to offset any negative impacts. On September 25th the NYS DOT informed Supervisor Beaury that public meetings would be postponed until early 2019. On December 15, the towns of Germantown and Rhinebeck, in coordination with Scenic Hudson, held a forum in Germantown titled “Balancing Passenger Rail Safety with Public River Access,” which drew more than 100 people. During the forum, elected officials, engineers, Scenic Hudson leaders, co-chairs of Germantown’s Waterfront Advisory Committee and attendees discussed alternatives to Amtrak’s proposed project, currently under review by the state Department of State. The alternatives explored during the forum—designed to address the railroad’s risk concerns as well as the public’s desire for continued open access to the Hudson River—included new pedestrian grade-crossings, hosting Operation Lifesaver rail education trainings and exploring the rails-with-trails concept, which has been employed along many other rail lines in the U.S. In Dec. 2018 the New York State Department of Transportation and Amtrak scheduled a Jan 29th meeting in Germantown for Amtrak to present its proposed plans and reasoning for installing fencing and gates along the Hudson River in Dutchess and Columbia counties. On Jan 7th of 2019 twelve town supervisors from towns that are impacted by the proposal sent a third supervisors letter to NYS Secretary of State Rossana Rosado detailing their many serious concerns. On Jan 18th Amtrak withdrew its proposal, and the Jan 29th meeting was canceled.